Covering just shy of one mile between N 128th Street and N 145th Street, the Linden Avenue project is often referred to as the missing link to the Interurban Trail. Plans to develop Linden Avenue were initially outlined in the Vision 2020 Broadview/Bitter Lake/Haller Lake Neighborhood Plan in 1999. 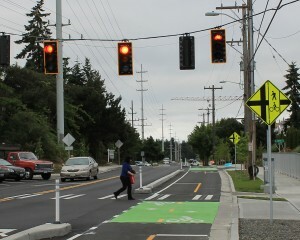 Following the adoption of the Seattle Complete Streets ordinance in 2007, Linden Avenue was identified as an ideal Complete Streets Pilot Project. The project won the Puget Sound Regional Council’s 2013 Vision 2040 Award for Excellence which recognizes work being done supporting the region’s long-term growth, economic and transportation strategy. A full overview of the Linden Avenue project is available here (pdf).